Sourdough is magic. It’s healthy, it’s tasty and it’s alive. But that doesn’t mean you have to be a magician to craft beautiful, tasty loaves from it. Baking Sourdough Bread guides you through the delicious world of sourdough from start to finish. Discover the history, the chemistry and the culture behind this distinctive dough. Learn to make a sourdough starter and keep the leaven active with regular feeding. Try different flours and unique ingredients – for example, did you know that you can make delectable bread with green tea or beer? It’s not just the recipes that make this book a treat – it’s the creativity it cultivates. Written by Goran Soderin & George Strachal. Dozens of recipes for artisan loaves, crackers and sweet breads. 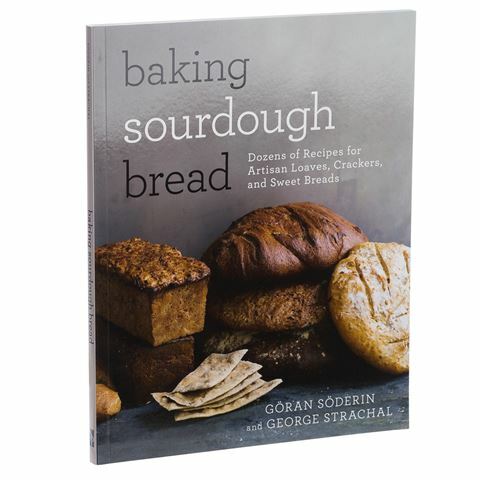 First section of the book delves into the chemistry, ingredients and process that goes into making sourdough bread. Second section explores how to craft sourdough starter loaves. Third section is filled with delicious recipes ranging from Russian sweet bread to Danish rye bread and brioche. Stunning photography by Helen Pe. Includes an index and acknowledgements at the back of the book. Dimensions: 19.5cm (l) x 24cm (h) x 1cm (w).